Happy New Year to all! Looking forward into 2017, I wanted to share some information about what I will be up to this year. This includes updates about my residency, some workshops and events, and some changes I have made to my online store and ordering. STORE - I now have my online store divided into two categories - Standard and Unique. Please click over to the STORE for information about the new format and ordering process. Thanks! RESIDENCY - This has been an incredibly full year as a resident artist at the Penland School of Crafts. After cutting out commission work and just focusing on making production tools, I successfully freed up more to time to make some work that I am really committed and invested in. This has mostly taken the form of locks, including a mokume gané padlock and a puzzle lock, but the real star of the show is a ten-bolt chest lock. I began constructing this in March of 2016, and as of January 1, 2017 I have officially made all the parts of the lock and now need to begin the chest which it will secure. This has been an extremely demanding and rewarding process, and I am so grateful for this time during my residency to indulge in making such an object. Here is an in-process image of the lock as of yesterday. There is still plenty of finishing to do, but it is fully constructed and awaiting the construction of its chest. I have been using Instagram to show some of the process in making this so far, so if you are interested you can see more by following me @sethgould. WORKSHOPS - This year I will be teaching two workshops. The first one is at the Center for Metal Arts. I have taught at CMA before and I am really looking forward to returning. It is a great teaching facility run by a fun and passionate group of individuals. 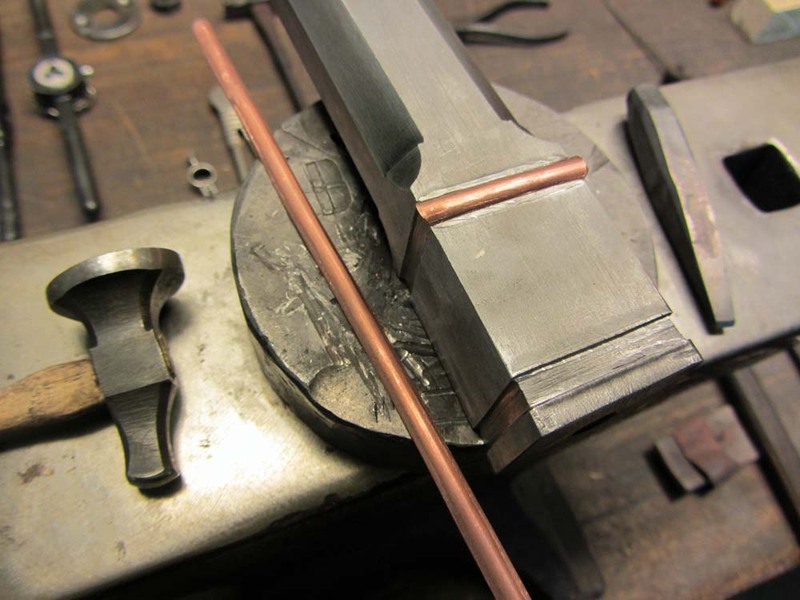 I will also be headed up to the New England School of Metalwork where I am excited to be teaching for the first time. Please follow the links below for more information. EVENTS - You will also see me around at a couple of events this year. First, I will be doing a short demonstration at the Fire on the Mountain blacksmithing festival right here in Spruce Pine, NC on April 29th. It is a great little festival and I hope to see you there! Next I will be making the trek out to Amana, IA for the Handworks 2017 event this year. The event is on May 19-20 and I will be bringing tools for sale with me and potentially doing some demonstration. I have heard nothing but good things about this gathering and I am really excited to be included this year. TRAVEL - I also have a research and education trip in the works to return to Japan the end of this year and study with several metalsmiths over the course of six weeks. More information to come! A new batch of hammers is now available. Head over to the STORE for more info. A few offerings this month including ten sets of standard dividers, two sets of custom dividers, and a set of kitchen utensils. Head over to the STORE to see more! I have also put two of my padlocks for sale in my STORE, so please have a look at those as well! Chasing hammers are now available! 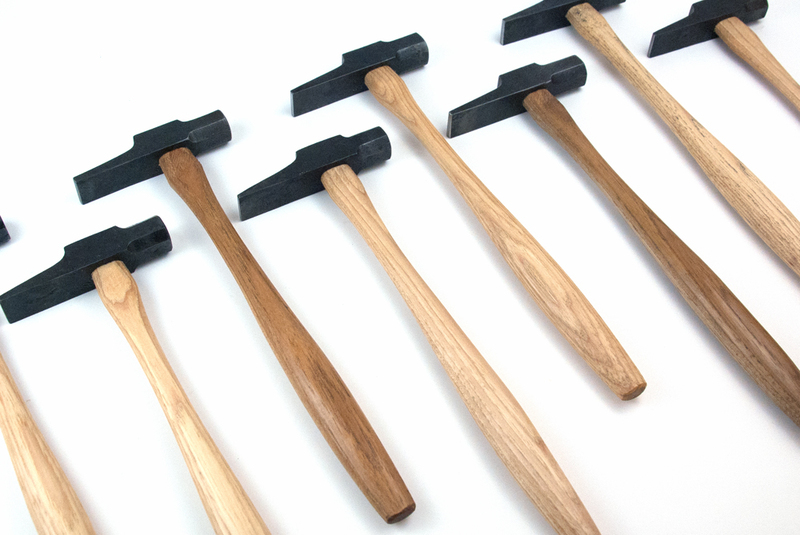 This includes the batch shown here, along with three one-of-a-kind hammers. Head over to the STORE for more information. Three Jeweler's Saws are available in my STORE. 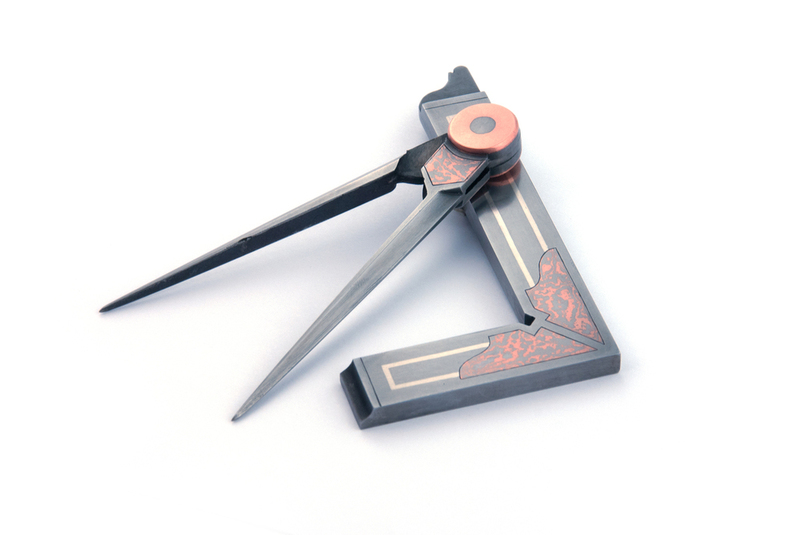 Each one is forged, fit, and uniquely embellished with decorative file work. In other news, I have a few pieces that are headed to Japan for a North American Mokume-Gane exhibit that show at two location over the next few months. The three pieces I made for the exhibit are a pair of DIVIDERS, a SQUARE, and a PADLOCK. 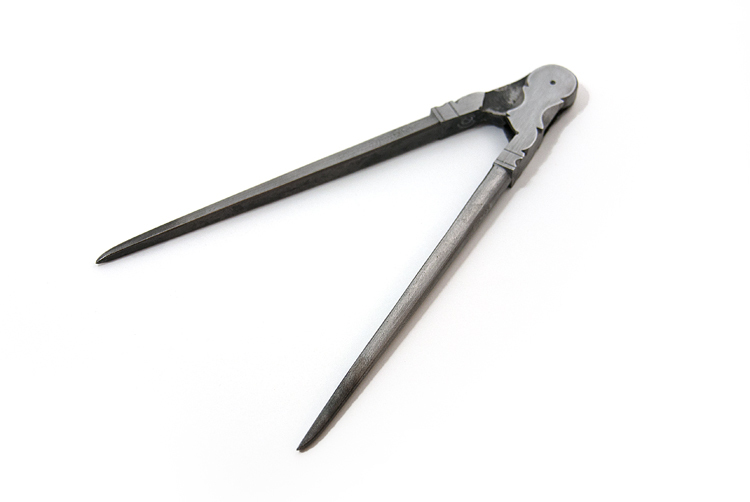 There is a small batch of outside calipers now available! Head over to the STORE to take a closer look. There are also a couple of Cross Peen Hammer still up for grabs. Go to the STORE to see more about these items. I finally have my shop up and running here at the Penland School of Crafts. I will be here for the next three years as a resident artist, a reality that I am still in awe of. The reason I applied for this residency was to have an opportunity to pursue a practice of making that will take more time, research, and exploration than I have been able to dedicate to my work up to this point. Below you will see a very small sampling representing the many source images that I pore over regularly. Influence from this type of work has made its way into my repertoire in the form of distilled design or detail, but I have yet to fully commit to the full potential of these objects. This type of work embodies a level of patience, craftsmanship, and intricacy that I intend to reach. I am looking forward to raising the bar for myself during this residency, pushing my skills and ideas to places they have not been before. Moving ahead, the majority of my time will be spent on the work I have described above. I will continue to dedicate part of my time to making work for my STORE though. In an effort to better manage my time and take full advantage of my residency, I have decided not to take orders and only sell work that I have in stock. This means making products in small batches or as single items, and once they are sold, that's it until the next batch. This will be a combination of items I make regularly and new items that I may only make once. Please let me know if you are interested in something that you see, as I will take that into consideration as I plan what I will offer in the future. Subscribe to my blog and follow me on Instagram @sethgould to receive updates when new products become available. Thank you very much for your understanding and consideration as I undertake this new endeavor. 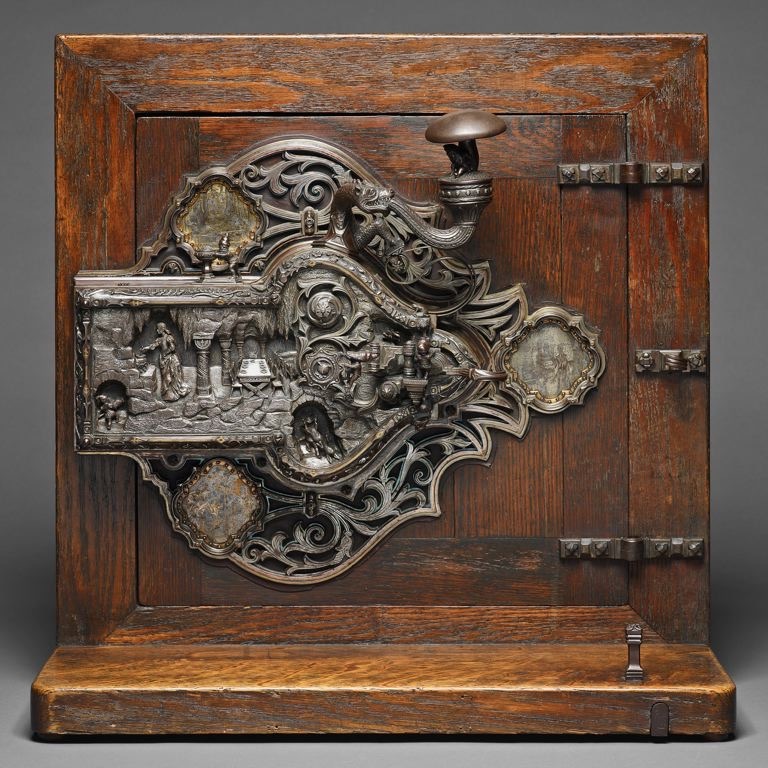 Left to right: coffer, Rouen, France; incense burner, Kyoto, Japan; plate from Diderot's Encyclopedia; tsuba at the Boston Museum of Fine Arts; plate of an unfinished lock, Rouen, France; door lock by Frank Koralewsky, Chicago, IL. In just a few weeks Liz and I will be packing a truck with all our belongings and headed to Penland School of Crafts to begin a three year residency. For the first eight weeks I will be teaching the Concentration in Iron, and following that I will begin setting up my shop at the resident artist studios. During this transitional period that I am without a means or making, I have stopped taking custom orders as well as put a hold on the tools that I sell in my STORE. You can expect to see things pick back up again once I get my shop running this winter. Thank you for your patience! The measuring tools in my store were unavailable for a while because I took a little time to make some adjustments to the design. The main change is to their length - I shortened them from 9" down to 7". I noticed that I was always reaching for the 7" pair that I have at my bench, and so it seemed obvious to make that size as my standard offering. 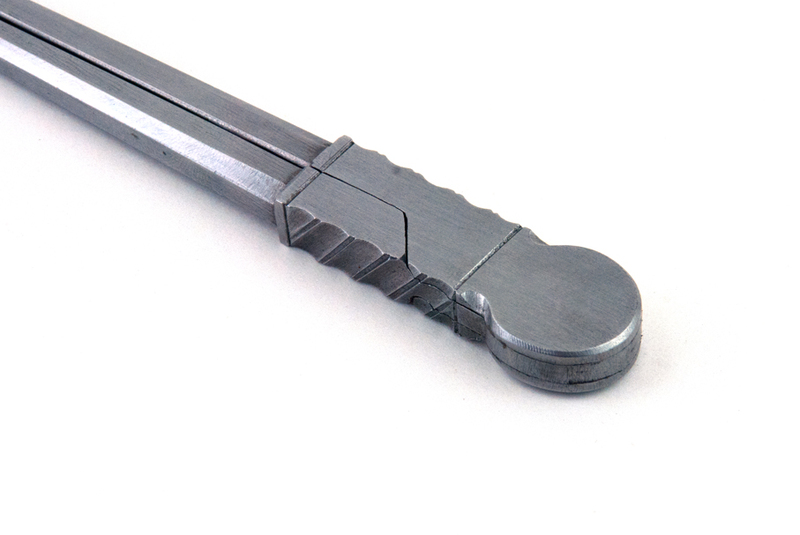 Whether you are laying out dovetails or forging parts to size, these dividers are a great size for a variety of work in a range of disciplines. I use my pair everyday. See more in my STORE. Also, a little side note is that I have recently made my way into the great wide world of Instagram. If you are interested in seeing more frequent photos of what I am up to, you can follow me @sethgould. Hope you see you there! April 24-26 | In just about a month I am headed to Ashokan, NY for the Northeast Blacksmithing Association's Spring Hammer-In. I will be the demonstrator for the weekend. There will also be an iron smelt going on, so it is sure to be a fun time. May 1-3 | I am sticking around the northeast to teach a class the following weekend at the Center for Metal Arts. 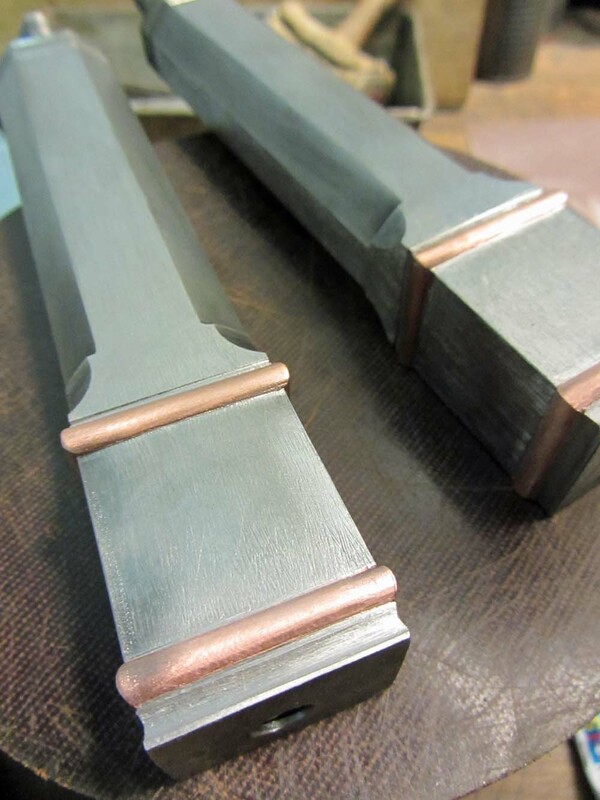 I think there are still a couple spots left in the class, so if you are interested in honing your forging skills as well as learning some decorative filing and inlay, head on over to their website to sign up. June 12 | I have a solo show opening at the National Ornamental Metal Museum in Memphis, TN. This is part of the Tributaries exhibition series they put on each year, and will also include an artist lecture at the Memphis College of Art. 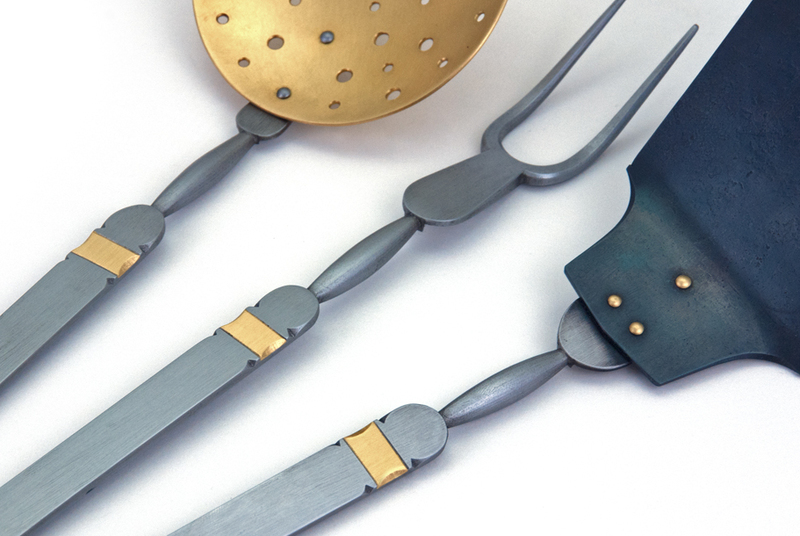 September 20 -November 13 | I will be at Penland School of Crafts teaching Fall Concentration in the iron studio. This two month long class will focus on forging, refining, and ornamenting small utilitarian objects. I am excited to share that Peter Ross will be joining me to co-teach for part of the concentration, so it is going to be a really excellent class. I will be sure to share more when Penland posts their fall classes online. In a way, standing over the stove is not so different than standing in front of the anvil, materials and tools at hand, making decisions in the moment with the goal of creating something to the best of your abilities. When my mind isn't on my work in the studio then there is a good chance it is on the next meal at hand. I make no claim of culinary proficiency, but cooking in the kitchen and consuming the fruits of my labor, or someones else's for that matter, brings a unique and essential joy to my life. It was about a year ago when a friend, knowing my weakness for over the top creation in both food and craft, handed me an issue of The New Yorker with an article he thought I would like. The article, written by Bill Buford, is about cooking with French chef Daniel Boulud and features an elegant dish that uses a very intriguing piece of kitchen equipment. 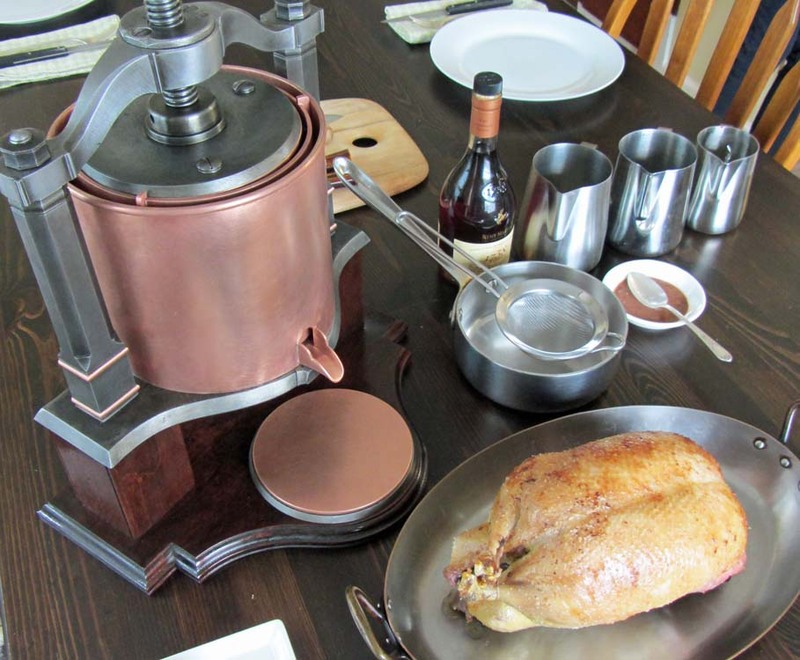 The dish is Canard á la Presse, and the equipment, or "flashy dining room toy" as Buford refers to it, is the the Duck Press. As I learned more about the dish and the press, the wheels started turning. There was no denying that I would need to make one of these. How could I not!? A few months later I was invited to participate in a show at the Houston Center for Contemporary Craft that would explore the relationship between craft and dining. They would be featuring a cleaver and meat tenderizer I made, and when the curator asked if there was anything else I would like to include, I knew the Duck Press' time had come. 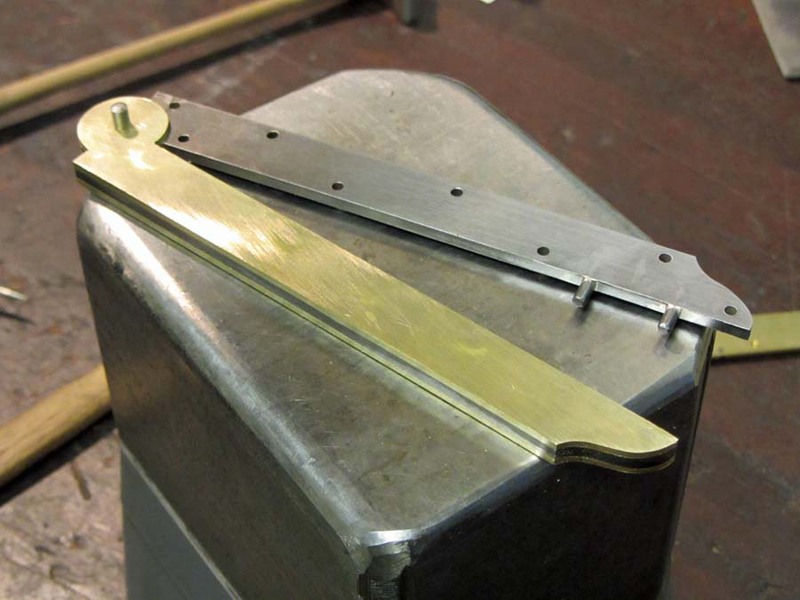 Most duck presses are cast bronze or steel that has often then been silver plated. Seeing as though I would be forging the press instead of casting it, my initial design challenge was deconstructing the framework into multiple parts that could be assembled after the fact. Once I had established a design on paper I was happy with, I made a model out of wood to see if the proportions would translate well three-dimensionally. That exercise led to some minor design changes, but then I was ready to begin. First the cylinders were rolled out of thick copper sheet and the bottom, rim, spout, and spacers were soldered on. 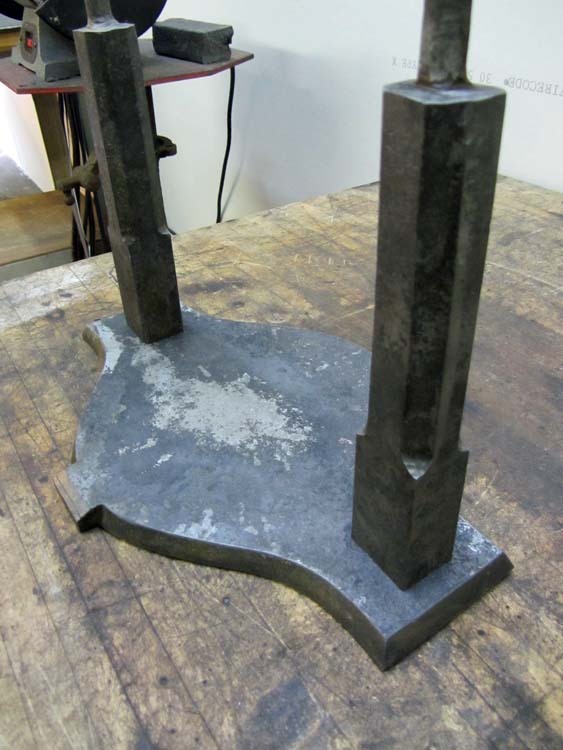 Next I began work on the forgings. 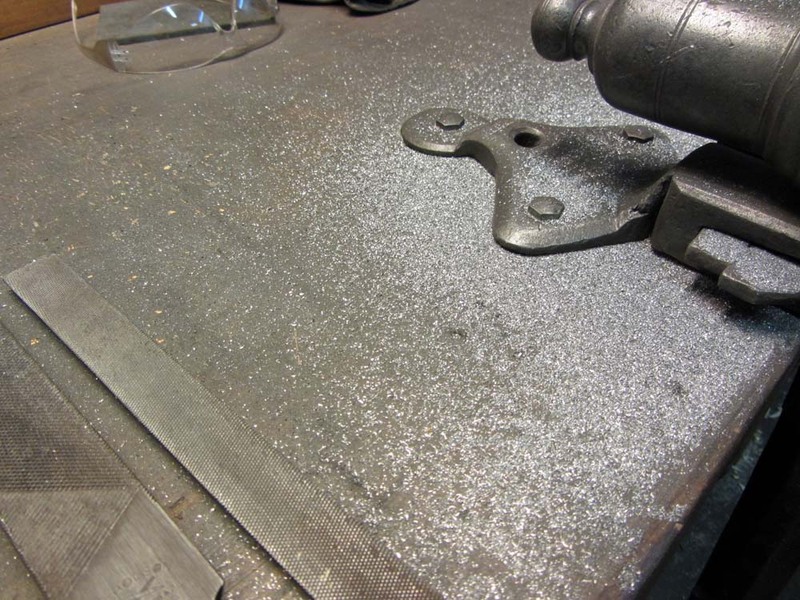 Except for the main screw, all steel parts on the press were forged first and then finished and detailed with files. That includes the 0.5" thick base plate which I cut with a striker and specially made hot cut. I had played with the idea of forged steel legs, but ultimately settled on making a wooden base for the press to be mounted on. I really do love the pairing of wood and steel, and along with the copper these materials create a really pleasing palette. The copper inlay was the last step, and by using the same half round wire the rim of the cylinders are made of, all the components tied together nicely. Canard á la Presse, or Pressed Duck, is the name most commonly given to this dish. It is simple in concept, but quite complex in execution. This dish is as much about the presentation as the food itself, and by many accounts is the height of tableside showmanship and elegance in French cuisine. For cooking this dish I turned to my friend Dan for guidance. From the beginning, Dan was completely on board for trying this dish, regularly asking when the press would be done. As an added bonus, he raised ducks this year so it didn't take much more than a walk to the backyard for our main ingredient. 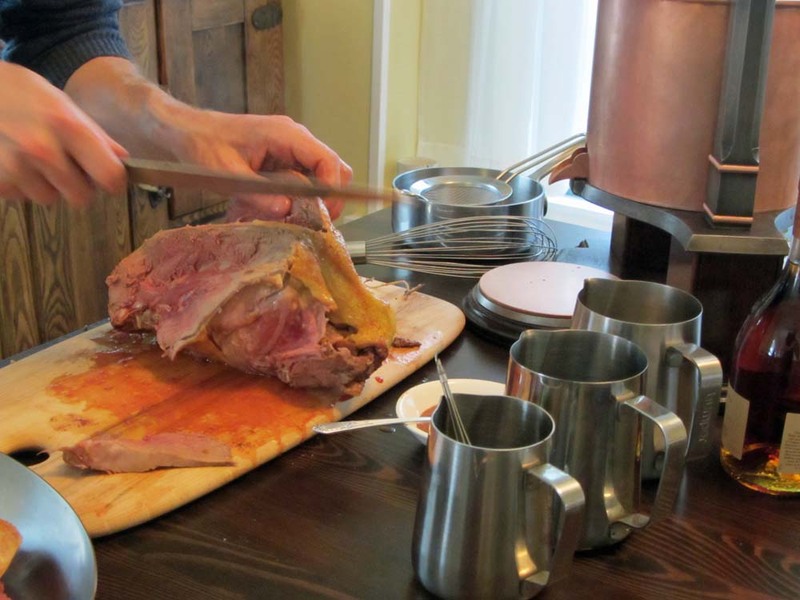 We slaughtered the duck a day ahead of time, and on a Sunday afternoon we took the press for a test drive. We did not intend to have the white tablecloth and silver cart meal that this dish is normally served as, but we were excited to see how the press would perform, and to do our best with this French classic. Following is a loose account of the steps we took. 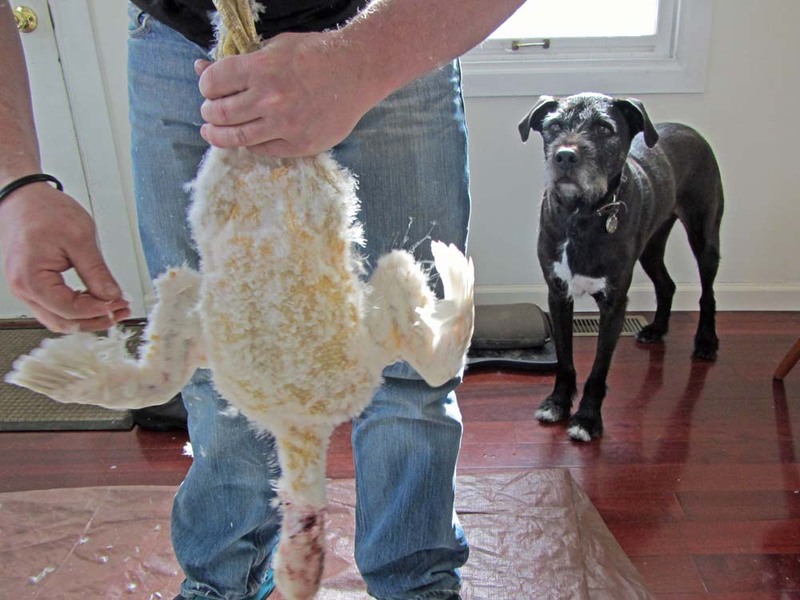 We cleaned the duck, leaving the heart and lungs in and reserving the liver to add to the sauce later. The duck was then roasted for 20-30 minutes at a high heat in order to brown the skin and leave the meat very rare. In any restaurant that serves this dish, everything after this point would be done tableside. After the duck came out of the oven, the breasts and legs were removed. The legs would be returned to the kitchen while the breast stays at the table to be served with the sauce. This is where the press comes in. The rest of the carcass was cut up into manageable sized pieces that would fit in the press. Once the press is loaded, the handle is cranked down which lowers the plunger and crushes the pieces of carcass. The inner cylinder of the press acts as a colander, holding back the bones and pressing out the blood, marrow, and any other liquids. Theses juices flow out the spout and are collected to be used for the sauce. 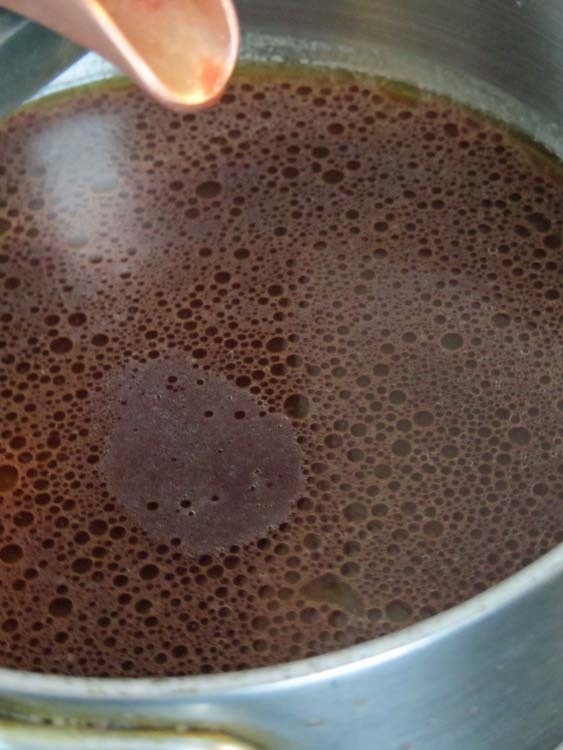 We cooked the pressed juices in a saucepan to which we added Cognac (many recipes call for Brandy of some sort), the liver, and blood we had collected when we slaughtered the duck. As the sauce finished, we poured it over the sliced duck breast and along side some roasted potatoes. This press was five months in the making - a long time to build up to a single course. It is exciting and rewarding for so much to go into one event, even if only for an afternoon with friends. I owe a huge thanks to Dan for seeing this one through, and I look forward to more pressed duck in my future. It is that lovely time of year when I have two fires to start each morning, one in the wood stove and one in the forge. I chip through the ice on the slack tub and run my tools through the fire to take the chill off before I start the day's work. It would be nice to stand in front of the forge all day, but there is still cold work to be done as well. 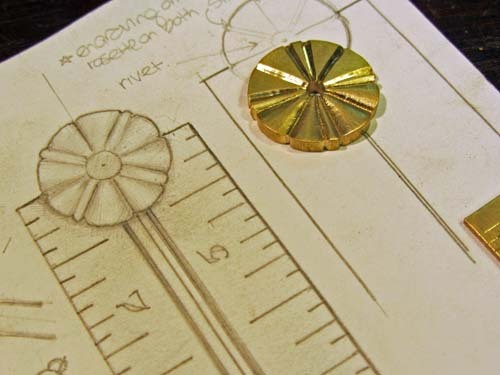 Here are some process and finished shots of a folding brass and steel ruler that I was commissioned to make. The delineation on the front measure 10 inches, and on the back, 4 cm. The rosette and markings are carved and engraved with hammer and chisel. I made one of these a few years ago, and I think it may have even been the first thing I ever engraved. It was very enjoyable to revisit this format with new skills and a different eye for the design. Luckily I got this done before the real cold hit, and now it's back to the forge to keep warm. I have added a new section to my STORE for one of a kind items. Here are a couple sets of dividers and a hammer to get the ball rolling. Happy Holidays! 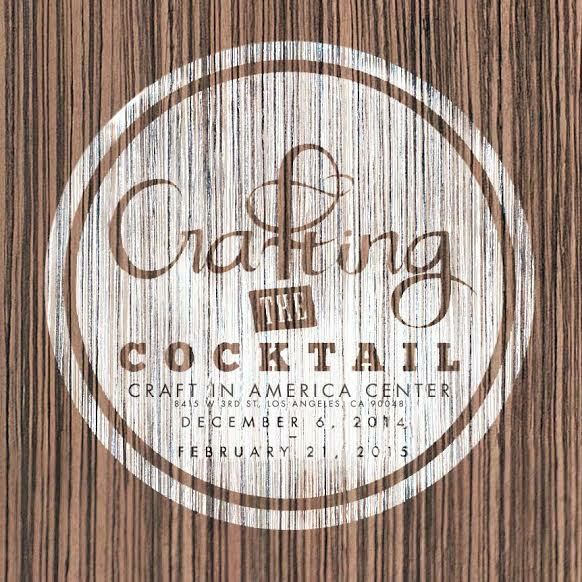 I will be participating in an exhibition called Crafting the Cocktail: Handmade Objects and Implements for Classic and Modern Libation at the Craft in America Center, in Los Angeles, CA. The bottle opener and corkscrew will be part of this exhibition which showcases handmade barware associated with enjoying craft cocktails. CRAFT IN AMERICA has teamed up with the MUSEUM OF THE AMERICAN COCKTAIL to host a number of events and talks across the city in conjunction with the exhibition. It opens on Dec. 6, and if you are in the area you should definitely check it out! Click the image below for more info. Some people get This Old House to come and remodel, but I have my very own This Old Studio to call on, also known as Mom and Dad. This past weekend my parents came out for the first time since they helped me do the initial building in the shop. This time we tackled constructing a temporary wall to divide the space in my shop and make it easier to heat in the cold Cleveland winters. I will be able to take down the framed plastic wall in the spring to enjoy the open bay door, but for the coming months it should help keep the shop a bit warmer. After they left I was thinking about how my shop has developed and changed in just the past year and a half. I am more observant than ever when I visit work shops or studios. I am more aware of what kind of light, space, storage, and all around layout they have and how they operate. I find that it makes all the difference in world to have a space you are comfortable working in versus one that just doesn't flow. 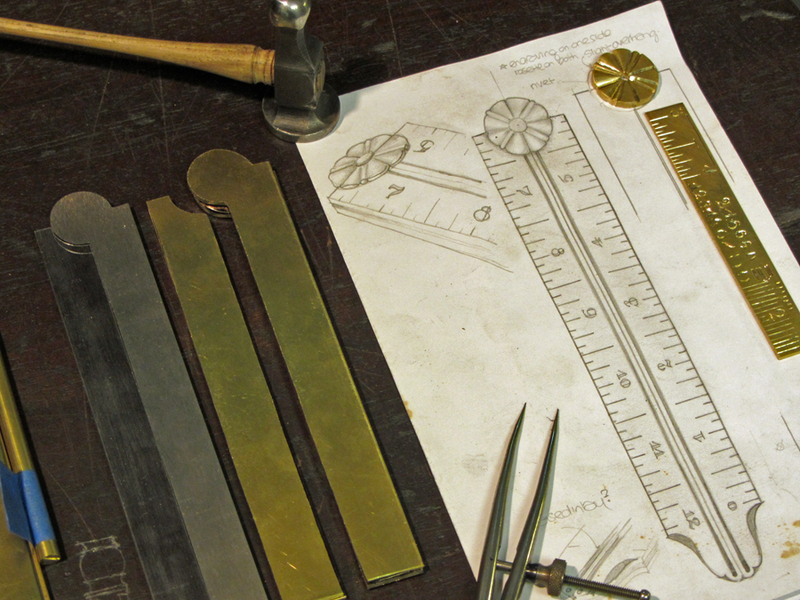 Also, here is a shot from my bench today of an engraved folding brass ruler I am working on. I made one similar to this a few years ago, and when a client approached me about making one for them I was excited to revisit the object with new skills and a fresh perspective. Here are some pieces that show a new style of brass inlay that I have been playing with. This broad inlay is accented through file decoration and provides a large canvas with potential for engraving or carving. 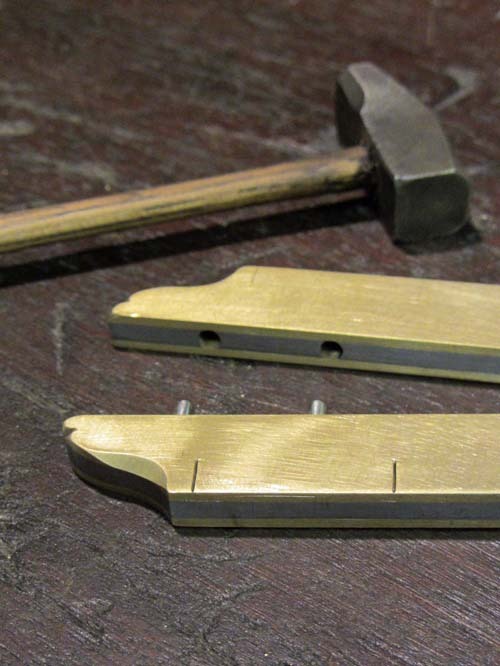 Unlike the line inlay, ninety percent of this inlay can be done with files right in the vise. It is a relatively quick way to add some very nice embellishment. I am excited to keep pushing this technique forward and see what else I can do with it. A few months ago, a friend asked me to help him out with an article he was writing for Edible Cleveland, a magazine that showcases the local food movement here in Cleveland. The aim was to do a how-to on making a barrel grill, so we got ahold of a barrel, collected some scraps and spent an afternoon piecing one together. It was supposed to be pretty down and dirty, so it was mostly cut and weld. We did fire up the forge for a little decorative touch as well, but you will have to check it out online to see that: Building a Barrel Grill.